Learn Aramaic: What language DID Jesus speak? Benjamin Netanyahu and Pope's disagreement opens debate on whether he spoke Hebrew or Aramaic. What language DID Jesus speak? Benjamin Netanyahu and Pope's disagreement opens debate on whether he spoke Hebrew or Aramaic. At a meeting in Jerusalem, Israel's prime minister told the Pope that Jesus spoke Hebrew and the Pope corrected him by saying 'Aramaic' Historians believe that Hebrew was the language of scholars and scriptures, so Jesus probably spoke both dialects Christ may have spoken a few words of Latin and Greek No-one knows the language he spoke for sure, or whether he could write. The Pope’s pilgrimage to the Middle East was controversial because of the holy leader’s impromptu prayer session at the West Bank’s barrier. 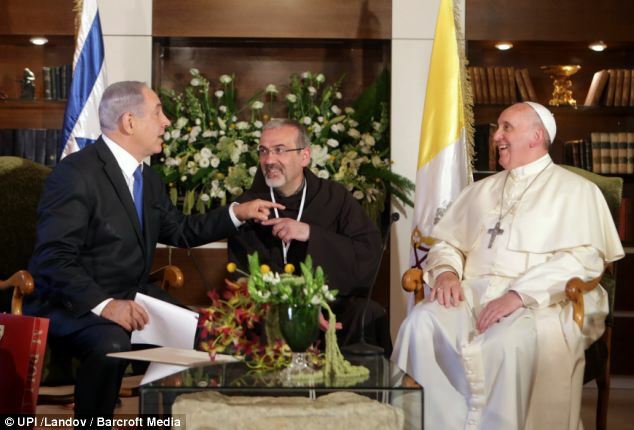 And a playful religious disagreement also took place between Pope Francis and Israel’s prime minister, which revolved around Jesus’ linguistic skills. Benjamin Netanyahu and the Pope had a small, good natured squabble about the language spoken by Jesus Christ. Scroll down for video. BIBLICAL ARAMAIC Most Biblical scholars agree that Jesus and his disciples spoke Aramaic, which was the common language of Judea in the first century AD. It is likely that Jesus spoke a local Galilean dialect and the towns of Nazareth was an Aramaic speaking community. Despite the increasing importance of Greek, Aramaic was the dominant language among Jews in the Holy Land and across the Middle East until the Arab conquest in the seventh century. Aramaic words frequently pop up in Biblical text, such as 'Abba, Father, ‘and place names including Gethsemane - the place where Jesus took his disciples to pray before his arrest - are thought to have an Aramaic root. No-one really knows whether Jesus could write. Some experts believe he could speak Hebrew. Opinion is divided as to whether the religious leader knew any Greek or Latin.